GARBOUSHIAN GALLERY is pleased to welcome the artwork of Mitsuko Ikeno and Kim Tucker in a two-person exhibition entitled Beautiful Ugly Things..
Artists Mitsuko Ikeno and Kim Tucker both dive deep into the beauty that can be found in the grotesque. Not everything in our world is aesthetically pleasing; in fact, many of the most beautiful things in this world are not visually alluring. 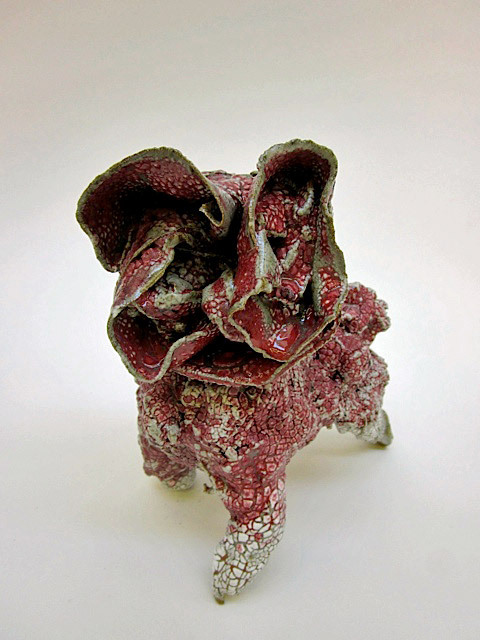 The exhibition Beautiful Ugly Things takes a different approach to looking at exquisite ideas, themes and creatures. 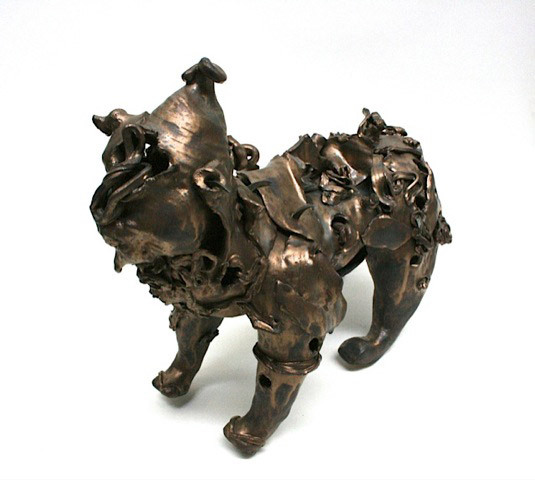 Tucker and Ikeno’s work both draw from the strange and unusual, finding a uniquely expressive and imaginative way to investigate life and its many tribulations through art. 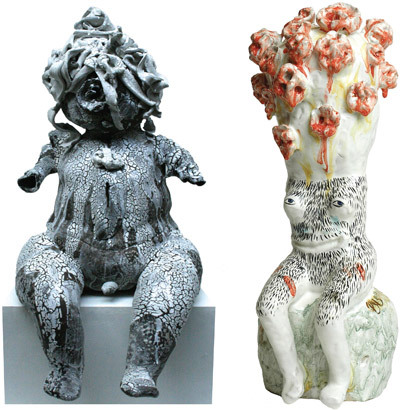 Ikeno and Tucker both create unique, vibrant and surreal three-dimensional artwork with clay, pushing the boundaries of ceramic and figurative artwork. Ikeno utilizes a spontaneous freehand drawing approach. 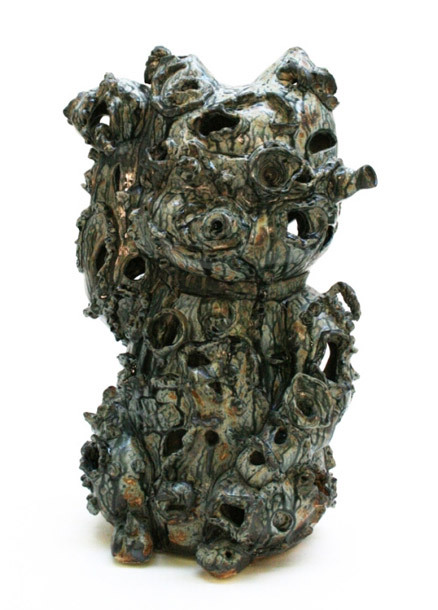 She aims to create a balance between figuration and abstraction, and creation and destruction in her work. Visually, her work is jarring and robust, tantalizing the viewer with its fantastical conception and playful analysis of reality. 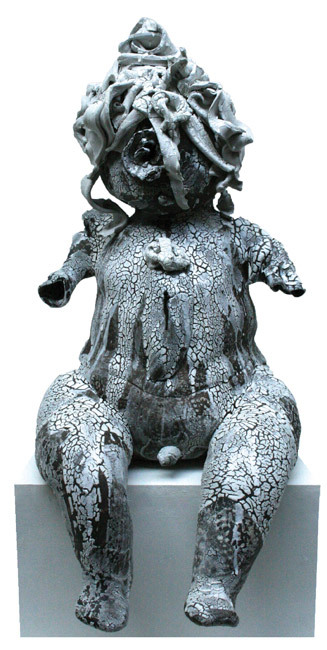 Her creations vary between figure-based objects and installations, but both often reference a kind of warped, fetus-like monster. 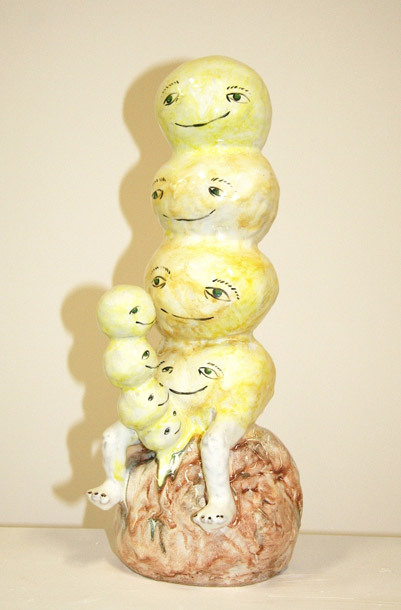 Though the figures are not humanistic, they do have aspects that relate to the human form. They exude calm and warm insanity, nothing fearful or malignant, though seemingly odd looking—tiny baby aliens, wanting touch and attention. 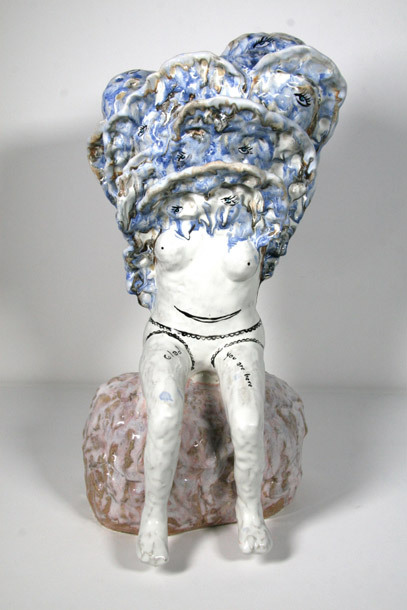 Her installations can often resemble clusters of creatures, as if all of her characters became cold and went looking for bodily warmth with one another. 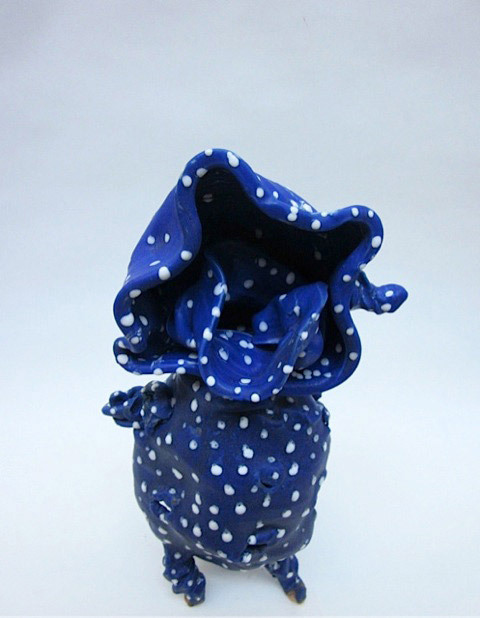 She has a keen eye for color and creative effects, making her installations and objects surreal and enticing. 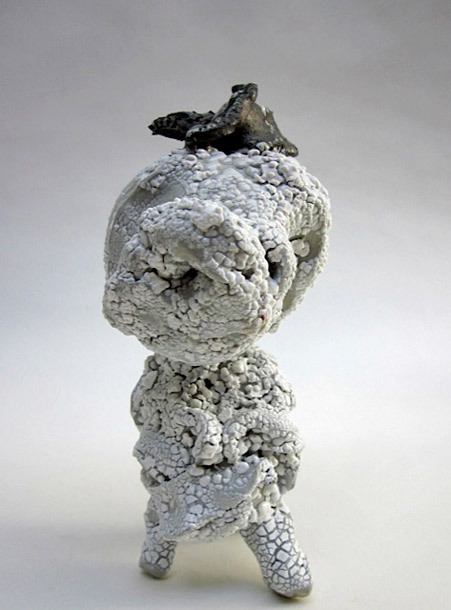 Tucker’s work is a sculptural expedition into the wild and woolly world of the subconscious. Hidden desires, complications, filtered memories and primal impulses mix together in the bold world of the inner mind. 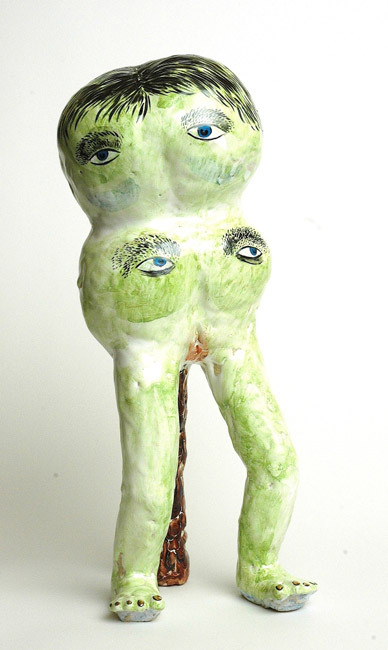 Her figures are manifestations of her unfettered mind, primal beings, ghosts and human dummies. 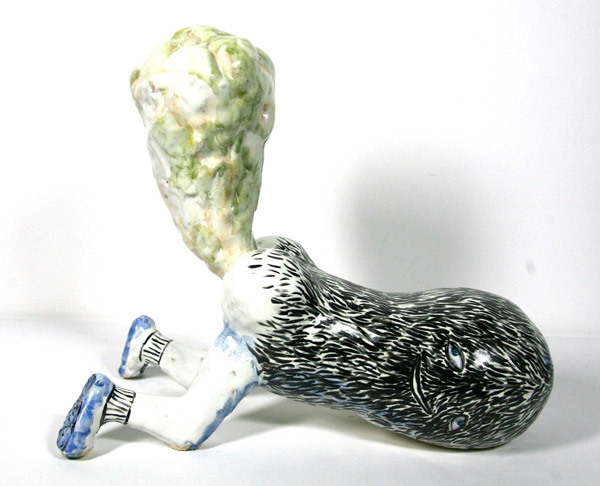 Stylistically, they reference folk art and the childlike imagination. Her forms are more human than Ikeno’s, with only small growths and strange abnormalities misplaced on her figures. They imbue a sense of illustration in their structure and creativity—they aren’t completely separate from this world of familiar images, but take some of our contemporary experience and human existence and alter themselves within a limited scope so we still relate to them. Though they do not look like people you see walking down the street, their humanity shows through, as does emotion and experience. In her practice, Ikeno looks for the moment of beauty where these seemingly opposite concepts collide. Because of the many possible combinations of interesting and unique collisions these creative concepts could have, Ikeno is constantly pushing and pulling themes, techniques and adventurous trials, trying to uncover more possibilities in her work, and hoping to achieve that perfect moment of balance. 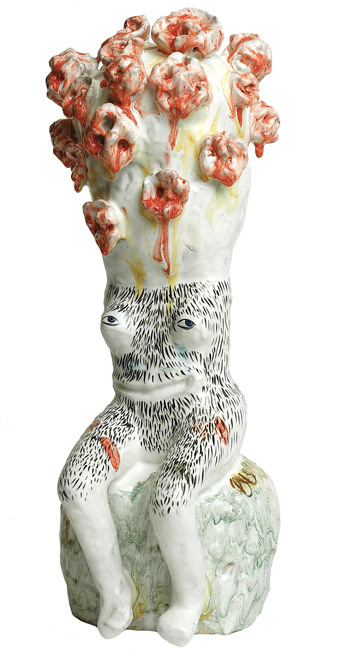 Imagination runs amuck in Tucker’s creatures, with whimsy and a chaotic confidence, these creations stand in defiance of the limited traditional ceramic dialogue. 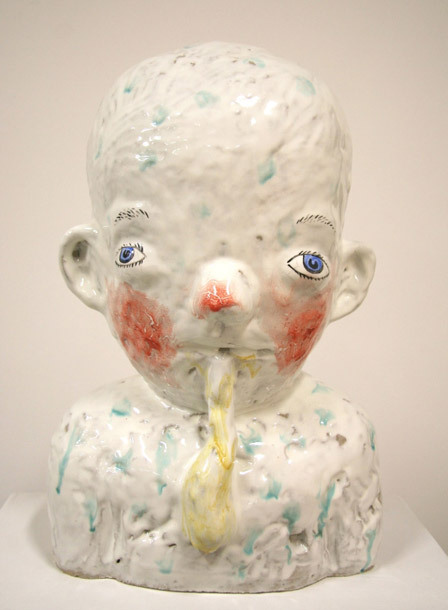 Tucker’s work is a challenge to the rules and boundaries of the conscious world; it is simply a place where the mind can freely experience impulse and wild abandon. 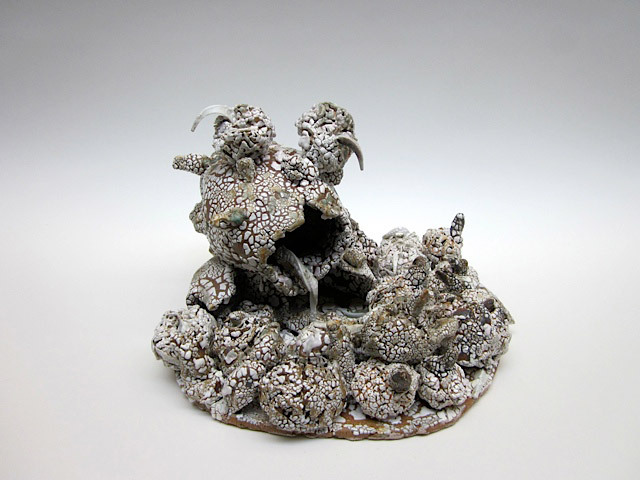 An opening reception for Beautiful Ugly Things exhibition will take place at Garboushian Gallery on Saturday, July 26 2014 from 6:00 to 8:00 pm. The exhibition will remain on view until August 29, 2014.